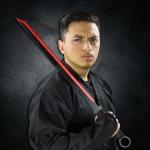 The Red Blade Kunai Ninja Sword has the power of a modern ninjato with the versatility of an entire weapons pack. 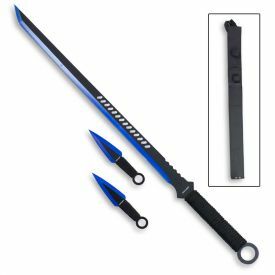 The 18" blade on this sword is sharpened and colored red, like the blood of your foes, and black, like the fear that grips the heart of your adversary when you wield this powerful ninja weapon. 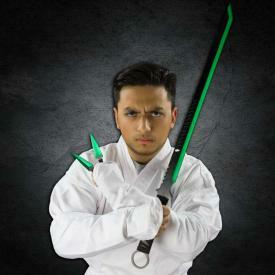 The blade on this ninja sword is designed with strategic gaps to keep it lightweight, aerodynamic, and vicious when thrusting into supple flesh. 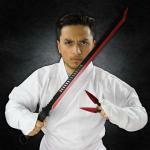 The red blade ninja sword comes with a matching pair of kunai. All three are full-tang weapons, being made out of a single piece of stainless steel. The 5" kunai match the 27" full-tang sword in color and the red ninja sword even has a ring pommel like the throwing knives do, which is a traditional feature of kunai that allows you to tie your weapon to a sturdy rope or chain and retrieve it after you throw it. Imagine how devastated your enemies will be when you throw a sharpened kunai into their chest and then yank it out to throw again. 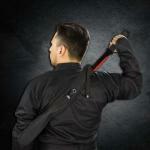 The red ninjato and red kunai also have black cord wrapping around the handles, which gives a more comfortable grip. 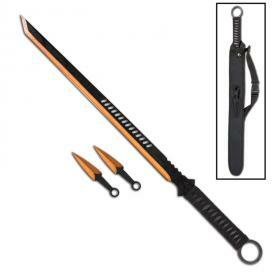 The sharp ninja sword and red throwing knives come with a special weapons case made out of nylon. The nylon carrying case stores both the sword and kunai in special pockets that allows you to carry your arsenal with ease and retrieve at a moment's notice. 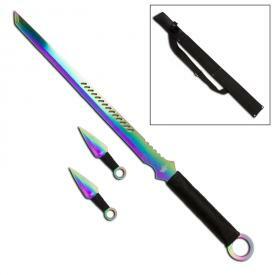 You'll need to access your weapons quickly if you're going to make a difference with this modern weapons set for the modern ninja.